Borderlinx | Buy Tom's and ship worldwide with Borderlinx. Cheap rates guaranteed. With the One for One project, Tom's helps a person in need with every purchase made. Started in 2006, the company has been matching a pair of shoes given to a child for a pair of shoes purchased. 10 million have been given in over 60 countries. To cover other basic human needs, Tom's has been selling eyewear to offer pairs of glasses to visually impaired people in developing countries. Not only the highly ethical Tom's is helping small communities with their products but also supporting them by creating local jobs, having part of it production based in poor areas. Tom's raises awareness with annual campaigns like One Day Without Shoes and World Sight Day and address the poverty issue. 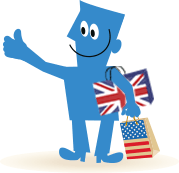 Now, customers can buy Tom's in the USA and ship internationally with Borderlinx! Determining cheap shipping, tax & duties upfront with our shipping cost calculatorBorderlinx will then ship your item to your home country. A number of services are available through Borderlinx to make international ordering from Tom's USA hassle-free, including concierge,, free repacking and consolidation services.